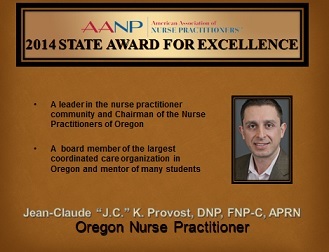 J.C. Provost, DNP, FNP-C, APRN received the prestigious American Association of Nurse Practitioners (AANP) 2014 State Award for Excellence at an awards ceremony and reception held during the AANP 2014 National Conference June 17-22, 2014 in Nashville, TN. The State Award for Nurse Practitioner Excellence, founded in 1991, recognizes a nurse practitioner (NP) in a state who demonstrates excellence in practice. Since 2004, Provost has been a primary care clinician with Housecall Providers (HCP), assuming the role of lead clinician in 2011. 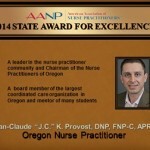 He is the current chairman of the Nurse Practitioners of Oregon and a mentor to third-year NP students from across the country including those attending the University of Portland, his alma mater. He also represents NPs as a member of the Health Share of Oregon Board of Directors. Provost is one of 22 HCP primary care clinicians making house calls to over 1,400 homebound patients in the Portland metropolitan area.